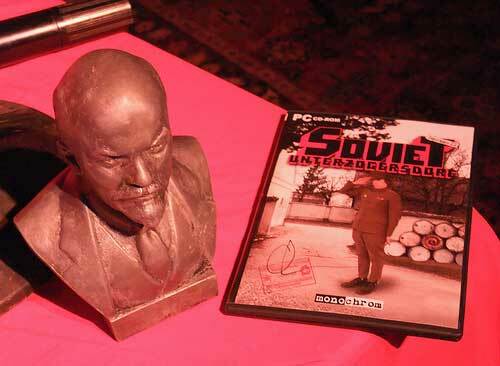 monochrom’s project “Soviet-Unterzoegersdorf” started ten years ago as the implementation of a “false reminiscence” into the European cultural memory — a fictitious, tiny country, first presented as a prankish theatrical LARP performance and public intervention, then turned into a adventure game series. According to postmodern debates, “history” and stories have been playing a central part in the development of national, ethnic and tribal identities. Computer game developers are hardly aware of these discourses and are not taking advantage of their valueable insight. The game series “Soviet-Unterzoegersdorf” combines (retro)gaming, (retro)politics and (crypto)humor to delve into this ongoing discussion. In this regard, the project is taking part in the production as well as the criticism of cultural and collective memories — both in politics and popular gaming. It is a commemoration and resurrection, and one more reminder that contemporary gaming (in its radical business-driven state-of-the-artness) dare not forget the (un)dead media of the past — or it will not have a bright future.